The CSPDC is proud to serve the estimated 301,485 residents within the five rural counties, five cities, and eleven towns that comprise the region. Over the past five decades, the region’s population has increased 61.8%, going from 186,306 in 1970 to an estimated 301,485 in 2018. The region gained the most residents (33,738) between 1990 and 2000. Although population increases have slowed since 2010, the region still displays healthy and steady growth patterns. The City of Harrisonburg with an astounding 274% increase, gained more people than any other locality in the region since 1970 and was designated a Metropolitan Statistical Area (MSA) following the 2000 U.S. Census. Ten years later, following the 2010 Census, the Staunton-Augusta-Waynesboro area was designated an MSA. This reflects their role as an area with a high level of social and economic interaction between the cities and county. 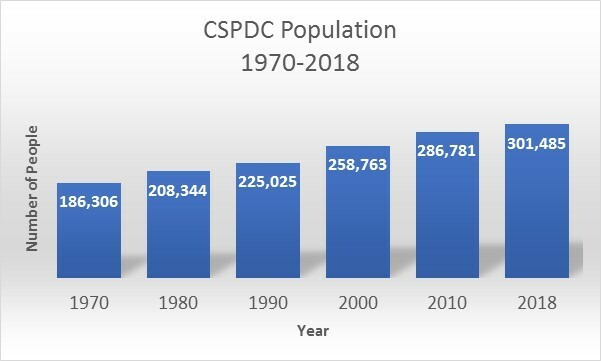 As it was in 1969, Rockingham County is the CSPDC’s most populated locality while Highland County remains the lowest populated locality with 2,265 people.